Politicians should not put people in jail. Nor should they override a court decision to grant bail. If police or prosecutors inadvertently make a terrible blunder, due incompetence or zealotry, they should correct it at the first available opportunity. These would seem fairly uncontroversial propositions. But not, it seems, once someone is tainted by a whiff of any alleged connection to terrorism. Despite the fact that crucial information provided to a court has since proved false, the Immigration Minister, Kevin Andrews, says he has no intention of reviewing his decision to incarcerate Dr Mohamed Haneef in an immigration detention centre. His decision was taken one hour after a magistrate granted Haneef bail on a charge of recklessly (but not knowingly) assisting a terrorist group by giving a used SIM card from a mobile phone in mid-2006 to one of his second cousins in the UK. Haneef, who was employed on a work visa at a Gold Coast hospital, told police he was leaving the UK and his cousin wanted the unused credit on the card. The Australian Federal Police (AFP) now admits that, contrary to the claim the prosecution put to the court, the SIM card was not in a jeep used in a failed attack on Glasgow airport on 30 June this year. An official transcript clearly contradicts other purported facts in an AFP statement tendered to the court about what Haneef told police when interviewed after his arrest. But the AFP refuses to say if it will inform the court about these errors, or reveal when it first knew that the information about the SIM card was false. A spokesperson for Andrews says there is no need for him to review his decision to lock Haneef up, because he acted on advice from the AFP which contained other information. It is understood that a classified annex contains information from the British police about their reasons for suspecting that two of Haneef’s cousins in the UK may be involved in terrorist activities, or at least have knowledge of such activities. Apparently, the annex does not contain any new material clearly incriminating Haneef in the provision of assistance to a terrorist group. However, all the law requires Andrews to decide is that Haneef is of bad character because he has associated with people reasonably suspected of criminal behavior. 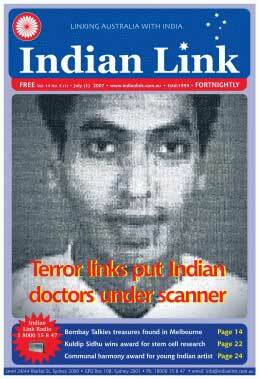 The only reason the young Indian doctor is currently incarcerated in an immigration centre, perhaps for several years until his trial is completed, is that he opted to stay in a Queensland jail rather than post the relatively low $10,000 for bail set by a Brisbane magistrate. The use of this extraordinary ministerial prerogative is not unique to the Haneef case. But it is normally exercised after someone has been convicted, not when a trial has just begun. Astonishingly, John Howard was still insisting as recently as Monday that his government had no role in the whole affair, despite the fact that a member of his cabinet had clearly overturned a court ruling on bail. The ministerial prerogative exercised by Andrews should not exist. If we are to pay more than lip service to principles that can be traced back 800 years to the Magna Carta, executive governments must not exercise judicial powers. Only courts should be allowed to imprison people for more than few days. The law should be changed so ministers can’t jail people. A possible exception is if someone spends a night in a detention centre before being deported. Even so, the decision to deport should be taken by an independent tribunal, not a politician who can be construed as having a political motive to appear tough on terrorism. Changing this law may be easier than ridding sections of the AFP, the prosecuting authorities and the Attorney Generals department of a dangerous mix of incompetence and zealotry whenever the slightest prospect arises of nailing a terrorist. The ability to reason from established facts, to follow the rules of elementary logic, and to accept innocent explanations for perfectly normal behaviour, seems to vanish when the word 'terrorism' is uttered. There is no excuse for the errors now revealed in the police statement to the court, or in the prosecutor’s false claim that Haneef’s SIM card was present at the scene of terrorist act. In each case, it was easy to check where the truth lay. These initial mistakes were compounded by a report in the latest edition of Brisbane’s Sunday Mail that police now suspect that Haneef was part of a plot to blow up the largest building on the Gold Coast and symbolically leave Australia on September 11. Initially, the AFP refused to confirm or deny this report. After the Queensland premier, Peter Beattie angrily demand an explanation in view of the assurances he had been given in briefings that there was no threat anyone on the Gold Coast, the AFP Commissioner, Mick Keelty, said the report was wrong. He also that the AFP was not the source. If so, the source would appear to be someone else at an official level who was happy to release false information designed to damage Haneef and alarm Queenslanders. As far as is known, there is no investigation underway to identify the source. Shortly after Haneef was charged on 14 July, Keelty, held a media conference where he assured the public that the investigation, "has been driven by the evidence and driven by the facts". Although hundreds of police were assigned to the investigation, this claim is demonstrably hollow. But no one in the federal government, or opposition, has expressed any concern that the over-eager behaviour of the police, prosecutors and ministers risks further radicalising Islamic youth. Terrorism involves the ancient crime of murder. Haneef is not charged with murdering anyone, attempting to murder anyone, failing to tell the police about a planned murder, or knowingly assisting anyone to commit murder. If ministers and officials don’t want to encourage the recruitment of more terrorists, they should take far more care to ensure that a charge of unknowingly assisting a terrorist group is only laid on the basis of clearly established facts. Essentially, the AFP is on public trial here..and for good reason. The real oddity is that the Conmmonwealth Director of Public Prosecutions has decided on a review (which is great news and an admission in itself) but has admitted that he hadn't taken a direct interest in the case itself. While it would be totally unreasonable for anyone to suggest that this DPP should involve himself in any or all of the cases that come across his desk, it is quite staggering that this particular case....this first such case under the new terrorism laws...should not have taken his eye, his interest and, quite properly, his highest priority. Attorney General Ruddock has darkly hinted...as a result of ongoing media scrutiny, that such scrutiny could result in people like Dr Haneef being held for even longer periods..and that the legislation might have to be "strengthened".In the event that the legislation is up for change I would have that all State AG's..and the nation's body of lawyers...church leaders even(Goodness what an opportunity for them to take the moral high ground...and why is it so often they're found wanting when they're needed? )...should join in and insist that visas should be quarantined and should not be turned into political playthings. I would also say that blame should not be confined to Government ministers. The fence sitting by would be Prime Minister Rudd ought to be also regarded as both reprehensible and unacceptable.Where are all the Labor lawyers when they're needed?Have they been muzzled as part of a dreadful price to pay for Rudd's election as PM? It may be that if Dr Haneef is freed and cleared....Australia will have him to thank for a more honourable approach to such detainees in future. Doing a "Haneef" would be seen as an unforgiveable handling of a so-called terrorism suspect. I had no problem with his initial arrest. I had no problem with his release on bail under the "extenuating circumstances" provisions of the terrorism laws. Since then we've lived in Austrlia II, a parallel world where Australia has adopted the rule of opinion and political exigency, and where officials and politicians have no knowledge the rule of law in the REAL Austrlia. When will we get it back? When the PEOPLE scream and holler "ENOUGH". The law is tough, it could still be tougher, but it needs to be administered fairly and without predjudice. How can that happenn when the agenda is clearly only that a conviction of ALL accused must occur, and ALL accused persons will have no right to freedom; nor to the protection of the rule of law that we espouse to be the basic tenet of our country. Don't blame the politicians when we go quietly like sheep to our own slaughter. Blame them when they refuse to listen to our voices. Kevin Rudd should be just as ashamed - his voice is needed to rally the response I feel is ready to be heard. We will not be bowed by terrorism, but we will retain our country - Austrlia I, not Australia II. I would have thought that this would be an ideal time for George Pell to comment on the morality of Minister Andrew's actions. Deprivation of liberty by arbitrary executive act would seem to be something that might warrant an Archbishop's warning as much as voting for stem-cell research. Why is he so quiet? Mick Keelty, head of the AFP, is in a position of great authority and responsibility to the citizens of Australia. He must have the personal capacity to exercise his authority so as to stand between politicians and proper police procedure and practice. If you are aware of the apparent role of the AFP in the sinking of the Sieve X and Keelty's evidence before various panels of inquiry on that matter then, in the light of the current astonishing police bungling, you might, like me, conclude that it is time for Keelty to go. What strikes me most about this disgraceful episode is that Howard and his minions in the ministry, AFP ,DPP and Attorney General's office apparently have no regard at all for the fact that they have may well wrecked the life of an innocent man and his family. No apology, however conditional, has been forthcoming from any of them. They are only interested in a favourable political outcome. Australian public life has indeed sunk to lows unimagined pre-Howard. I read your comments with interest;what you write provokes some thought. Thanks Maureen. And lest I be accused of Pell-bashing, it is interesting to note that neither the Salvation Army nor the Anglicans nor Hillsong (all heirarchical structures) have have spoken out against Andrews. Only the Uniting Church (which has at least a semblance of internal democracy) has, so far as I have been able to ascertain, spoken out in clear unambiguous words against Andrew's actions. Sorry.Brian I think my days are numbered,which is a particular problem because ,I dont think that is entirely said of my own volition.I am one of the completely brain-washed and I am sinking .If you have the time yourself and, your face,reminded me you maybe seeing a closing horizon..could you update any new insights you may have had of your own ,if possible, about the brain-washed amongst us.For years now I have felt my thoughts are simply not my own,and even these maybe a trap for you to raise a spectre.My anger will not be finished if that is the case.Please be careful your name popped into my head today,and I dont like people being part of a problem I cannot beat.I mentioned your name at Lavartus Prodeo I have admired your tenacity in the past. Foreign Affairs Minister Alexander Downer said recently: "Muslim extremists are a Muslim issue - not ours." The fault with this view is that it transfers ownership of this challenge from the elected leaders to a minority group who simply don’t have the resources to deal with such a global crisis.